Steel frames are used in many commercial high-rise buildings, as well as industrial structures, such as ore mines and oilrigs. Enabling construction of ever lighter and safer structures, steel frames have become an important topic for engineers. This book, split into two parts covering advanced analysis and advanced design of steel frames, guides the reader from a broad array of frame elements through to advanced design methods such as deterministic, reliability, and system reliability design approaches. This book connects reliability evaluation of structural systems to advanced analysis of steel frames, and ensures that the steel frame design described is founded on system reliability. Important features of the this book include:* fundamental equations governing the elastic and elasto-plastic equilibrium of beam, sheer-beam, column, joint-panel, and brace elements for steel frames;* analysis of elastic buckling, elasto-plastic capacity and earthquake-excited behaviour of steel frames;* background knowledge of more precise analysis and safer design of steel frames against gravity and wind, as well as key discussions on seismic analysis. * theoretical treatments, followed by numerous examples and applications;* a review of the evolution of structural design approaches, and reliability-based advanced analysis, followed by the methods and procedures for how to establish practical design formula. 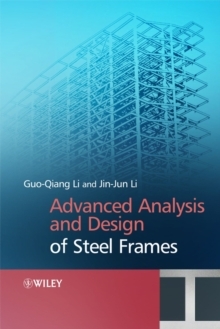 Advanced Design and Analysis of Steel Frames provides students, researchers, and engineers with an integrated examination of this core civil and structural engineering topic. The logical treatment of both advanced analysis followed by advanced design makes this an invaluable reference tool, comprising of reviews, methods, procedures, examples, and applications of steel frames in one complete volume.